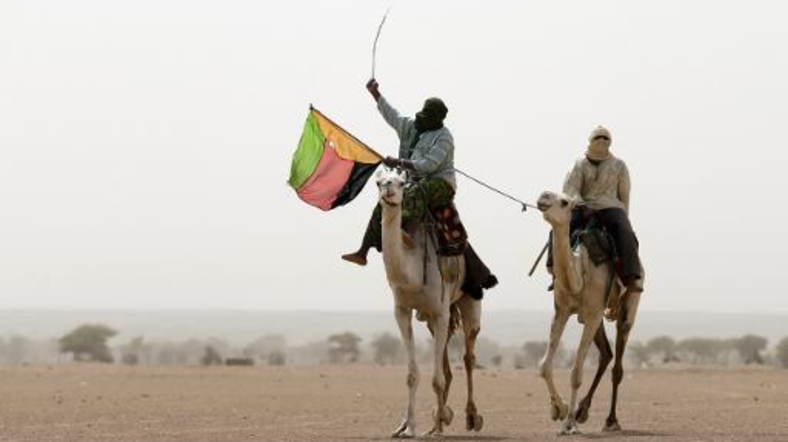 Three Tuareg and Arab rebel movements in northern Mali announced their merger on Monday to form a united front in peace talks with the authorities in Bamako. The National Movement for the Liberation of Azawad (MNLA), the Arab Movement of Azawad (MAA) and the High Council for the Unity of Azawad (HCUA) adopted a “political platform,” a “negotiating committee” and a joint “decision-making body” after several days of talks in Burkina Faso. The groups said the decision was “guided by a common political will to prioritize the best interests of the people” of the vast northern desert region they call Azawad, adding that a political solution was the only option for securing peace. The merger will go ahead "within 45 days" after the membership of each of the groups had approved the move, they said, adding that no name had yet been chosen for the new movement. An accord signed in Ouagadougou in June envisaged a cessation of hostilities between the Malian army and MNLA and HCUA fighters in the run-up to the presidential elections. The MAA is a recent creation by Mali’s disaffected northern Arab communities who wanted more influence in discussions with the government in Bamako. The rebels resumed peace talks with the Malian government in October, notably about the northern territories where they are fighting for autonomy, nine days after staging a walkout. The announcement was seen as a kickstart for the peace process after a grenade attack, a suicide bombing and renewed fighting shook northern Mali following the rebels’ decision to withdraw from the talks on September 26. The rebels’ walkout had dealt a blow to hopes of a durable peace in the troubled west African country, which only elected a new president in August after 18 months of political crisis sparked by a military coup last year. The Malian government has categorically refused to consider self-rule for the country’s vast desert north. The day after the peace process broke down, two Malian soldiers were wounded by a grenade attack in rebel stronghold Kidal. A suicide bombing attack followed swiftly in another northern city, Timbuktu, killing two civilians and wounding six soldiers, according to the government. Al-Qaeda in the Islamic Maghreb claimed that 16 soldiers were killed in the attack. Fresh fighting also broke out in Kidal, where insurgents attacked the army.